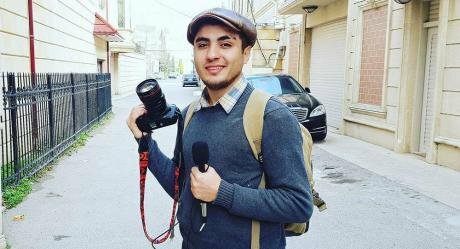 This January, five political prisoners in Azerbaijan, in an unprecedented act of solidarity, released a letter in support of jailed blogger Mehman Huseynov. The five signatories of the letter, released on the 13th, are Ilkin Rustamzade (activist, sentenced to eight years in May 2014), Giyas Ibrahim (activist, sentenced to ten years in December 2016), Bayram Mammadov (activist, sentenced to ten years in December 2016), Elchin Ismayilli (journalist, sentenced to nine years in September 2017) and Ahsan Nuruzade (religious activist, sentenced to seven years in March 2018). They are calling on Azerbaijan’s 130 other political prisoners to join them. The letter comes on day 19 of a hunger strike started by Mehman Huseynov, a popular blogger known for his satirical reporting on inequality, corruption and social justice. Huseynov, 26, is chief editor of Sancaq TV (The Pin), a socio-political magazine active on Facebook, YouTube and Instagram. Before his arrest in March 2017, Huseynov was working on a campaign (“The Hunt for Corrupt Officials”) that documented corruption in the high echelons of Azerbaijan’s ruling establishment. In one of the last interviews posted on YouTube before his arrest, Huseynov asked residents of Baku whether they would choose their wives as their first secretaries or assistants if they were president or a director of a large company – a clear reference to President Ilham Aliyev and his wife, First Vice President Mehriban Aliyeva. The video was uploaded on 27 February 2017. Huseynov was arrested on 3 March 2017 in a Baku courtroom, where he was charged with defamation and sentenced to two years behind bars. This story does not begin or end here. If anything, it is just one chapter in the struggle of Azerbaijani advocates of freedoms and equality – and Huseynov is one of many heroes of the story. Mehman Huseynov, 26, has lived without a national ID since 2012. In June 2013, Huseynov was detained at the Haydar Aliyev International airport, en route to Norway to receive the Gerd Bucerius Free Press of Eastern Europe journalist award. At the time, police told Huseynov the travel ban was connected to an ongoing case from 2012 when Huseynov was detained for allegedly assaulting police officers at an unsanctioned anti-government rally. Following his release, Huseynov had to sign a pledge not to leave Azerbaijan. In 2014, Huseynov was informed that his national ID was fake and that there is no such person as Mehman Huseynov registered in the system. Huseynov requested information from the Ministry of the Interior, which confirmed that his documents were in order. Finally, in September 2015, Huseynov was hoping to receive his new ID when he was detained at a local e-service centre. After being kept for several hours, according to Huseynov himself, he was released but told that the reason for his detention was a ban on all his documentation. Without any documentation, and repeated harassment and pressure at the hands of ruling Baku, the situation further escalated in January 2017, when Huseynov was reportedly abducted and tortured whilst in police custody. Following his forced temporary detention, Huseynov was subject to a fine in total amount of 200 AZN (£91) in a closed door hearing where he was found guilty of disobeying a lawful order. When Huseynov described the inhumane treatment he was subject to during his detention, the Chief of Baku police filed a lawsuit against Huseynov, accusing him of giving false information about his detention and treatment. As a result, in March 2017, Huseynov was sentenced to two years of imprisonment on defamation charges. In previous cases, journalists, rights advocates and activists often were sentenced to jail on charges such as drug possession, hooliganism, money laundering and abuse of power. Huseynov was the first to receive a sentence for defamation. According to the criminal code, the maximum time for this sentence is three years. The fact that Huseynov received two years attests to what Huseynov’s supporters describe as the Azeri government’s attempt to keep Huseynov locked up. In late December 2018, just short of two months before release, Huseynov was presented with a new set of charges, accusing him of alleged physical violence against a prison officer. The reaction both at home and abroad to the new charges and Mehman Huseynov’s decision to go on a hunger strike has been overwhelming. Under the hashtag #FreeMehman, scores of civic activists flooded the social media accounts of President Ilham Aliyev, his wife and their socialite daughter Leyla Aliyeva. A support rally in Baku on 4 January was followed by several administrative detentions and fines, before being violently dispersed by the local police. But while protests in Baku have been dispersed, political emigres and dissidents living abroad have organised rallies in Germany, Canada, Sweden, the Netherlands, Lithuania and elsewhere. Exiled Azerbaijani rapper Jamali Ali released a song “My Queen”, calling on the authorities to release Mehman and others. Several members of opposition parties have announced their decision to join Huseynov by declaring a hunger strike as well. On 14 January, investigative reporter Khadija Ismayil also announced her decision to join the hunger strike while the numbers of imprisoned political prisoners joining the strike in solidarity from prisons is growing following the call on 13 January. On 17 January, the European Parliament passed a resolution, calling for Huseynov’s unconditional release. The resolution was backed by all major parties in the European Parliament, and calls on Azerbaijan for full guarantees of media freedom and freedom of speech. “What is important not to forget is that Mehman was sentenced on bogus charges the first time, and now is facing new bogus charges. So even if tomorrow Mehman stops the hunger strike, we should not forget why he started it in the first place – as a protest against the charges,” said Rasul Jafarov, a prominent human rights lawyer, in an interview on 14 January. A statement issued on 12 January 2019 by 13 Human Rights Houses, explain in detail the bogus allegations and the real implications of new charges against the blogger if found guilty. According to Huseynov’s lawyer Shahla Humbatova, Huseynov is facing a possible new sentence of up to seven years. This is the gravest of sentences one can receive for the alleged offense Huseynov is being accused of. He was sentenced to two out of possible three years in 2017 and is now facing anywhere from five to seven. There were two previous cases of political activists dying in Azerbaijan while in prison. In November 2007, Faina Kurgunova died in detention at the age of 33. She was the first female political prisoner to die in prison while on a hunger strike. Kurgunova was a member of ADP – Azerbaijan Democratic Party and was serving her time for alleged drug possession. At the time, the reported cause of death was “depression” and “malnutrition”. Ten years later, Mehman Galandarov, an activist and blogger was found dead in his prison cell, having hanged himself. In both cases, prison authorities tried to manipulate these deaths, saying, at first, that nothing was wrong. Similarly, in the case of Mehman Huseynov, official statements (such as this one) allegedly claiming that Mehman ended his hunger strike and that he is well are far from surprising. Rasul Jafarov believes only what comes from Mehman directly or through his lawyer and people who visit him: “As a former political prisoner, I know how these letters, statements can be manipulated. And I can 100% confirm that the most recent letter circulating around was fake, it was not even his handwriting.” This can also explain the new reports pressure against political prisoners who have gone on hunger strike in support of Huseynov, including threats of new charges if they do not stop. Will a hunger strike change the behaviour of a Council of Europe member state known for its poor human rights record? Or will it be yet another story that will go down in history as just another silenced voice, desperate for justice?